Middelvlei Wine Estate lies in Stellenbosch's south-western suburb of Onderpapegaaiberg. A unique barrel tasting experience includes an informative cellar tour, a tasting from the barrels, and a tasting of the wines, served with a sampler portion of biltong, cheese and water biscuits. 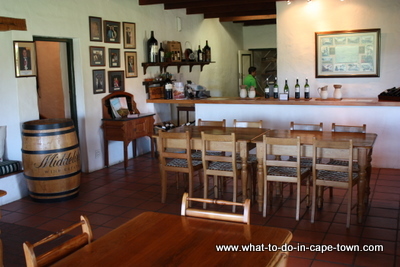 The restaurant caters only for groups and provides outdoor cuisine like barbequed boerewors and smoked snoek with hanepoot jam. Accommodation on the farm exists of a single self-catering cottage. On arrival, you’ll be welcomed by a tail-wagging pack consisting of two hospitable Dachshund - Pongrácz and Pinotage, Ruby the Jack Russel and the friendly Blümmenweiler pups Chiante and Rosé. Pontac the trusty Boerbul, Tinta, the gentle Great Dane and the Ridgeback, aptly named Malbec, complete the welcoming committee. 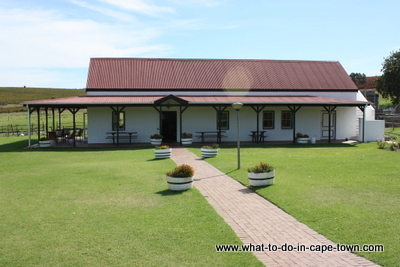 Also contributing to the charm of Middelvlei are the miniature horses - Port and Jerepigo, the donkeys, two potbelly pigs, Cameroon pygmy goats and several mountain tortoises. You can also look forward to meeting the three wallabies, the youngest of which was born at Middelvlei.